I admit: I’m a sucker for a good theme. Whether it’s a park, a party, a store, or a restaurant, I just love those little visual and sensory touches that bring an immersive design together. For me, a well-done, fun theme can make the difference between a good experience and an amazing one. 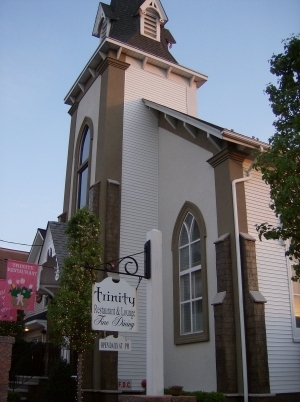 I had heard a lot of good things about Trinity Restaurant (84 Broad Street in Keyport), so my husband and I decided to check it out. Talk about a well-done theme! Not only is the restaurant housed inside a beautiful little converted church, but the slightly cheeky religious motif extends into other details: the bible-black menus with section titles like “In the Beginning” and “Into the Fire,” the custom wrought-iron railings with tiny crosses, the sumptuous red draperies, and the intact hymn boards in the corners, to name a few. I could barely keep myself from gaping at the serene beauty of the place. It’s definitely a restaurant in which the building is part of the attraction – if you go, be sure to give yourself a tour. All right, so enough about the surroundings. How was the food? We started with the Green and White Asparagus appetizer, which was drizzled with vinaigrette: delicious and perfect for a warm summer day. My husband then ordered the Hukilau Pot, a savory seafood stew with veggies and couscous. His exact quote was: “This is the best one of these I’ve ever had,” which definitely means something, since he is quite the seafood connoisseur. In keeping with our predilection towards fruits of the sea, I had the Pure and Simple Broiled Monkfish. The citrus and basil oil was delicate and tangy, the fish was deliciously moist, and the vegetables were steamed to perfection. Dessert was chocolate, as it usually is with us: Malted Milk Pannacotta with sea salt sprinkled on top. Kind of like a chocolate-covered pretzel in custard form. Delicious! Throughout the meal, the service was friendly and quick, and we were lucky enough to have a chat with the owner and the chef before we left. It’s not often that you actually get to give your compliments to the chef, so we happily did so. All in all, our dinner at Trinity was a real treat. After eating at so many chains from day to day, it seems like an almost spiritual experience to partake of food prepared by a real, honest-to-goodness chef with a focus on taste and presentation. It’s a theme restaurant, yes, but thankfully that theme is paired with a true dedication to cuisine and a great sense of customer service. Rachael Citron lives in Matawan, where she owns Glass Slipper Weddings and Events, a full-service wedding and party planning service. She can be reached at rachael@glassslipperweddings.com. 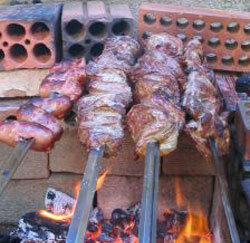 Brazilian & Portuguese BBQ coming soon to Matawan! On Main Street across from the train station, a new BBQ joint is “Coming Soon”. It’ll be situated in the middle of the building between the cleaners and dog groomer. There are a few big signs on the store front windows; one practically yells “Matawan BBQ“, another proclaiming “Brazilian & Portuguese BBQ“, and another with a list of the types of foods that will be available. No word on opening date. There’s a number, too, on one of the signs, but the light turned green and I didn’t have a chance to write it down. I’m excited. I love BBQ. I don’t have much experience with Brazilian or Portuguese BBQ, but I’ve always wanted to try. I hope it opens before the end of the summer! Stay tuned. We tried Koo Neo-Japanese Asian Fusion Restaurant in Marlboro tonight. Overall, not bad. Service, though pleasant, was mildly disjointed. The food was good so no worries there. He had the fried calamari for app, said it was okay, nothing special. I had the “Roti” – Asian pancake with chicken curry. I wasn’t sure how to eat it; I actually dipped the pancake in the curry sauce. It was tasty. For my main, I had the Fantastic Eel roll and Tri-Color roll. Both were quite good and amply sized. The thing that stood out the most on the eel roll was the seaweed salad inside. Eel is typically my favorite, but the seaweed salad inside definitely kicked it up a notch! The Tri-Color roll has salmon, avocado, and ginger inside, tuna & yellowtail outside. I usually don’t like ginger, but this worked and I enjoyed it. He had the sushi & sashimi combo and noted that it was really good. No complaints at all. The prices were on par with other sushi restaurants in the area. So I say it’s worth a visit especially if you’re into trying new places. FYI: they do not do split checks. Something about the software not able to do it. But they will charge the same bill on separate cards if they have to. My plan was to go to Espresso Joe’s in Keyport for lunch today. I got in the car and headed over to Keyport. When I turned onto Front Street, I saw that it was blocked off and, much to my pleasure, a street fair was going on. I love street fairs! So I found a parking spot on a side street, and walked up Main Street. Lining both sides of the streets, vendors of all kinds were selling their wares… clothes, jewelry, accessories, candles, specialty items, and more. Then I saw signs that said 1st Annual Keyport International Food and Music Festival. Wow! I had NO idea this was taking place, yet something was drawing me to Keyport today. I love happy surprises! Read the rest of this entry ? This evening we checked out Maru Restaurant in East Brunswick. It’s in the same shopping plaza as Makkoli Seafood Buffet. Originally I had wanted to go back to Makkoli, but then changed my mind and decided to try Maru instead. In addition to Korean entrees and specialties, they also offer sushi. And yes, they DO have Korean BBQ! Sadly, I don’t know much about Korean restaurants but from what I could tell it was pretty authentic. There were a few tables with chairs on the right and several tatami tables to the right. The decor is simple, nothing fancy. Due to a questionable stomach, I avoided the (typically spicy) Korean food. Instead, I opted for some miso soup and a couple of rolls. The “castle roll” was essentially a California roll with eel and avocado on top and the crab and tomago roll which was just crab stick rolled in rice with some tobiko outside. There was no sign of tomago (egg) to my disappointment. Perhaps the server didn’t hear me correctly when I ordered. I decided to eat the roll as presented to me. With the exception of the missing tomago, they were both fine. He decided to have the Bibim Naeng myunm, which is a cold buckwheat noodle and spicy beef dish. He commented it was tasty. They were sure to bring us the “banchan” — which is all the little side dishes that come with a meal. I enjoyed the bean sprouts and diakon. He, of course, enjoyed the kimchi. It was a change of pace from the typical sushi restaurants we go to, however I don’t know if I would rush back. I’d like to try some of the Korean restaurants in the Edison area some day when my stomach isn’t so ultra-sensitive. This Weekend in Red Bank & Asbury Park! Very exciting time of year in Monmouth County for Jazz/Blues enthusiasts and Gays alike! Friday kicks off the 22nd Annual Red Bank Jazz & Blues Festival at Marine Park. While I dig the music, I go more for the BBQ! Some of the best BBQ in NJ is to be had there for sure. I’m hoping to swing by on Friday night. Who’s game? Sunday marks the 17th Annual Jersey Pride Celebration. As always there will be a parade, live entertainment, and, you guessed it, BBQ!!!!!! I look forward to “coming out” to support my gays! Who’s coming? A new reader of my blog emailed me recently and commented on my love of sushi restaurants. He suggested we check out Makkoli Seafood Buffet (their site is down right now it seems) in East Brunswick. All-You-Can-Eat Sushi? Count us in! So last evening we drove down to East Brunswick in search of this glorious sounding buffet. It was a bit of a challenge to find at first since I’m not necessarily familiar with the area. It’s strip mall city out there, so I got confused as to which one it was in. I had to call for clarification on where it is. FYI: it’s on the Southbound side of Route 18, next to the U-Haul (across from the Wendy’s). We finally got there around 5:30 and were seated immediately. We ordered our drinks and were off to load our plates! I had some seaweed salads, sashimi, and lots and lots of sushi and rolls. I loved almost everything I had. However, I discovered I was not a fan of salmon skin or Spanish mackerel. No worries, there was plenty of other sushi and rolls I love! In fact, I ate so much sushi, I really didn’t have room for much of the hot foods. I tried a spring roll and some noodles, but that’s about it. In addition to just about every sushi and rolls you can think of, there is a big variety of hot stuff, too. Teriyaki, tempura, etc. And of course there’s the seafood! He had the king crab legs, shrimp, and oysters. He commented “I easily ate at least $60 worth of food myself!” It’s true. You get a ton of food for a bargain. But how is the sushi you ask?! Not bad at all actually. I can’t say “Best sushi ever!” but not at all horrible either. The price is totally right! 2 of us w/ drinks the bill came to $46! I know for a fact we’ll go back again! 4 out 5 stars, for sheer amount of food, quality, and affordability! Here’s another great blog review of Makkoli.